My style is very feminine but I prefer to mix it up with masculine pieces to keep it from looking overly saccharine. That's why a chic men's inspired blazer is a huge staple in my closet. I have them in navy, black, cream, tan, pastel pink, and gray. I love the contrast that this blazer gives to this romantic dress and my Foley and Corina handbag adds a nice bold pop of color! I love the floral maxi dress, soooo pretty! This is really good!! Love your outfit, the color mix is amazing...and those bracelets..wow! I love mixing masculine and feminine also.. Beautiful outfit!!! lovely photos! your hair is looking amazing as always! oh my! I love your bag! Gorgeous as always! You are definitely a master mixer with feminine and masculine pieces. I always use a blazer to ground my frilly dresses, I love the contrast! The outfit is really cool..The bangles, ring and bag looks lovely!! Ah, this is so pretty! 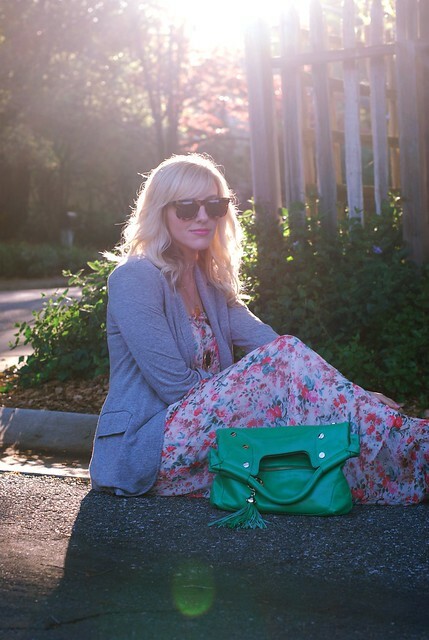 Loving the maxi dress, so soft & romantic, and the blazer really helps to break it up! Gorgeous! these photos are so beautiful!! Love this dress paired with your necklaces. stunning! You look great blending feminine pieces with masculine styles. And that bag is such a gorgeous hue! i love that look! i am looking for a new maxi dress, but haven't had any luck yet... i love yours! That dress is so pretty and I really love that jacket! Your style is flawless! LOVE IT! I'm a huge fan of the maxi dress... I like to call it my sweat pants of summer... I like that you paired your dress with a blazer, who knows maybe I'll pull away from my cardigans? those bracelets are SO GREAT! You look gorgeous! Love the romantic look of these pictures. So beautiful! The light is very "Princess Diana"- love it! That's a gorgeous dress, I adore the patterning and the colours lovely :) the lighting in these pictures is stunning :) lovely sun! Really gorgeous! I didn't think a blazer could ever pull together a maxi but you have proved me wrong! wow! that dress is amazing! I want something like that! Great combo of the dress with the blazer, then those bracelets - they work great together! Gorgeous, I love just the touch the blazer gives and how the colors play together! Love this outfit! It's the perfect mix between masculine and feminine. I love this maxi dress and I loved the way you chose to photograph it, with the sun shining through it. Truly gorgeous! When I first read this post, I did a double take bc it sounded so much like Emily from Cupcakes and Cashmere. You and Emily are the only people I've seen use the word saccharine, haha. i think I will be adding it into my vocab though...love it! Your bag is the most gorgeous colour, and I love your nail polish too, it's really the small details that can make an outfit fabulous. love the blazer with the flowy dress, and the spiked bangles. cute! why have i never seen your blog until now?!?! ?1 you are ADORABLE! I need a Maxi dress, like, NOW! :) you blonde bombshell, I love it!!! I love maxi dresses they are so comfortable! This is a really cute outfit! Wow! such great lighting in these pictures! I love the mix of flowy and structured. You look fantastic! That whole outfit is gorgeous! I really love the way the color of the bag stands out against the small flower print! I love how you toughened up this gorgeous, ethereal dress with chunky jewelry... So chic! These photos are incredible! Love the sunlight highlighting all your lovely features. Kudos to the bf! And I love that Lulu's dress. Stunning! This outfit is really cute!! I posted my clutch version of this bag today. Foley + Corinna is the best! im in dire need of a great maxi. the color of that bag is perfect! love this! espcially the cute blazer. I was just thinking about how I should style my long maxi dress for work and totally forgot that a crisp blazer makes everything come together! Thanks for the reminder! Lovely photos, you look great as always! I still need to buy a maxi for when it starts to heat up, this one is beautiful. I like it paired with the blazer. A perfect pairing! This blazer is perfect with your maxi dress, love the colorful print and this bag goes with EVERYTHING! That dress is just so amazing. Love how you've worked it. great outfit! I usually don't like florals, but that dress looks so beautiful and romantic on you! OK this is officially my FAVORITE outfit post. Lvoe the soft feminine floral and the blazer and the pop of green..it all just WORKS! Beautiful shots in the sunlight too. Great dress! love the color of your bag! I die for that bag. OH my goodness that color!!! and I feel i am the same way with my style. and that would likely explain why i find you such a style inspiration. I gotta start shopping at Lulus more. Loving that dress. 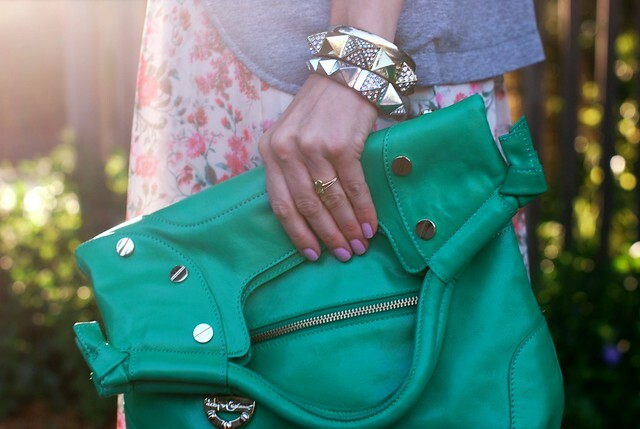 And the pop of green from your bag is perfect during the spring weather! Perfection! I love that green bag. Just bought a yellow clutch, but I may have to add a green on to my collection. O M G, I absolutely love this look!! I love that look! Everyone is wearing maxis!! Love it! You're right the blazer pairs so well with the floral dress. I'm a sucker for a maxi! I can't wait to wear them! I also adore that Foley & Corina bag, I feel like I've been eyeing it on the website forever now. The Handbag is amazing. The perfect color for summer! I love your outfit!!!!! It's so pretty! This is such an adorable outfit! Love the girlie dress paired with the masculine blazer. Such a cute style!